Bed bug bites are very difficult to identify, mostly due to the fact that people react to bed bugs in very different ways and their bites are often confused with other biting insects. You will find some pictures of bed bugs and images of bed bug bites* on this page that will help you identify problems with bed bugs. We can help protect you and your family from bed bug bites in the future with our bed bug products, click “Read more” to find out how. FACT: Bed bug infestations are increasing globally, and are causing businesses and home owners major problems and headaches. WHY? There are several reasons why bed bug infestations are on the increase. 1. Firstly, it is important to know that bed bug infestations are not linked to poor hygiene – bed bugs are terrific hitch-hikers and their populations are spread when they catch a ride on the clothes, luggage and personal items of people going about their daily business. Their spread is simply the result of the movement of people. It is impossible to avoid many of the activities considered high-risk for spreading bed bugs; Shopping in stores, visiting loved ones’ homes, checking into hotels, going to the movies and taking public travel are some of the most common ways to transmit or contract bed bugs. 2. Secondly the exponential growth in global travel means that bed bugs travel far and wide with ease. 3. Thirdly, people have forgotten what to look for – bed bugs were common place in the domestic world pre-1950’s – but new chemicals introduced at the time virtually eradicated them. This was great, but unfortunately resulted in people losing the knowledge and skills needed to deal with them. 4. Finally – many of the aforementioned chemicals, so effective at dealing with bed bugs are no longer available for use – rendering even pest controllers virtually powerless to prevent the spread of these bugs. The longer bed bugs are allowed to breed and feed, the harder and more expensive they are to get rid of. 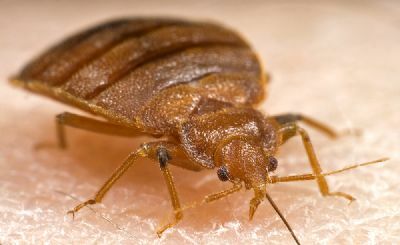 By the time people start seeing and feeling bites, bed bugs have probably been in their home or businesses premises for a number of months and the place is likely to be overrun with hungry adult bugs. Bed bugs bread very quickly and this escalation is costly and stressful for homeowners, and potentially ruinous for businesses, hotels and building owners. If the problem of bed bugs is caught early, they can be dealt with successfully and relatively inexpensively. We can give you the tools to do this. How can we help? Our company (Midmos Solutions) offers a range of products designed to help protect families and business from the problems of bed bugs. • The BB ALERT® - Pesticide-free, bed bug monitoring system. BB ALERT® puts the nightmares described above to bed, detecting bed bugs early so they can be dealt with before they become a bigger and much more expensive problem. • Secure Sleep™ Encasements – We offer a variety of encasement products designed to protect you and your family from bed bugs. What is BB ALERT®? BB ALERT® is a bed bug monitoring system featuring a proactive monitor, BB ALERT® Active which is used once a month. The monitor is placed in the area of risk (usually next to the bed) and then works to provide the best system for bed bug monitoring on the market. By detecting bed bugs at an early stage you can enlist professional help to deal with the problem at a fraction of the cost and much less hassle. What is Secure Sleep? Secure Sleep™ is a range of products designed to protect from bed bugs in a variety of places and situations. Our range includes, mattress and pillow protectors – impenetrable by bed bugs; luggage liners that prevent bed bugs travelling home with you and laundry Bags preventing bed bugs from following your laundry around the house. MIDMOS SOLUTIONS will never share, sell, or rent individual personal information with anyone without your advance permission or unless ordered by a court of law. Information submitted to us is only available to employees managing this information for purposes of contacting you or sending you emails based on your request for information and to contracted service providers for purposes of providing services relating to our communications with you. If you wish to cease receiving e-mails of interest from us simply email marketing@midmos.com or follow the instructions at the end of any or our emails. If you have received unwanted, unsolicited email sent via this system or purporting to be sent via this system, please forward a copy of that email with your comments to marketing@midmos.com for review.